Authenticity is a funny old thing. In most musical genres you care to mention, there’s always a die-hard bunch of fans who complain that these new artists aren’t as good as the old ones, things were much better in the old days, blah de blah de blah. Of course, they are missing the whole point that the artists they so venerate were in fact reacting to the status quo of their own time, and were trying something new and revolutionary. Wanting new music to be like the old is just hypocrisy. In that respect, hip hop is exactly the same. Even today, you still get people harping back to the old days of these artists, with Run DMC often spoken of in revered tones. Yet these acts – Run DMC in particular – were trying something new in a genre that had only really started to get mainstream attention. With Run DMC, it was mixing hard, tough beats a million miles away from the jauntiness of earlier hip-hop, mixed with some of the best rapping ever committed to vinyl. Listening afresh to “It’s Like That”, you’re struck by how little fat there is on the record. It’s totally stripped to the bone (unlike the superfluous and pointless Jason Nevins remix). You could drive an Escalade through the gaps between the beats. You really don’t need me to tell you this is a great record, do you? 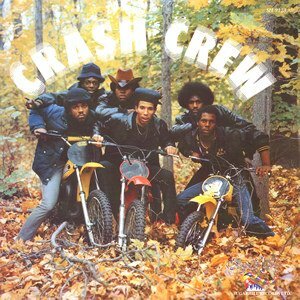 Crash Crew’s “On The Radio”, by comparison, is much more like the hip-hop that preceded it. You know the drill, a bunch of rappers, a funky backing track, and lots of bragging. Perfectly nice in its own way, and the record cover is frankly superb. There aren’t enough scrambling bikes in music these days, you know. As for Rammelzee vs. K-Rob’s “Beat Bop” – blimey, it doesn’t half go on. A bit like a cross between Rappers Delight and the The Message, it’s entertaining enough, and certainly forward-looking, but sheesh, 10 minutes? Boogie Down Productions “South Bronx” is notable for KRS-One’s fantastic rapping style. Rather than going 10 to the dozen, trying to get as many words out as possible, he makes a statement. In the 300mph world of rapping, he was a revolutionary; by being that bit more thoughtful, he gives you space to consider every word he says. And he had a lot to say; this track is a furious denouncement of MC Shan and his track “The Bridge”. Poor Shan had the temerity to state that the Queensbridge Projects was the birthplace of rap. Bad move, Shan. Backed by Ced Gee (of the Ultramagnetic MC’s), KRS-One goes off on one, and after an opening tirade (“So you think that hip-hop had it’s start out in Queensbridge\If you popped that junk up in the Bronx you might not live”), he goes on to explain how hip-hop really got started in New York. It’s a direct forerunner of the East Coast/West Coast beefs of the 90’s. Because next up it’s the fury and rage and power of Public Enemy, then the polar opposites of A Tribe Called Quest and De La Soul, and with them, the realisation that there’s rather a lot more to this music than bragging and slagging. These acts showed the way, with small and big changes here and there that started to turn rap into a huge global megaforce.